It’s fair to say, my MBP is dated and well past it’s prime. It’s a Mid 2009 13” Core 2 Duo that I purchased new in Jan 2010. It was my very first personal laptop and has worked flawlessly for the last 3 years. I’ve taken good care and given it three updates (before this week), Memory Upgrade from 4 Gig to 8 Gig, HDD Upgrade from the default 270 (or so) Gig to a 1 TB Western Digital Caviar Blue. The third upgrade was from OSX Snow Leopard to OSX Lion. 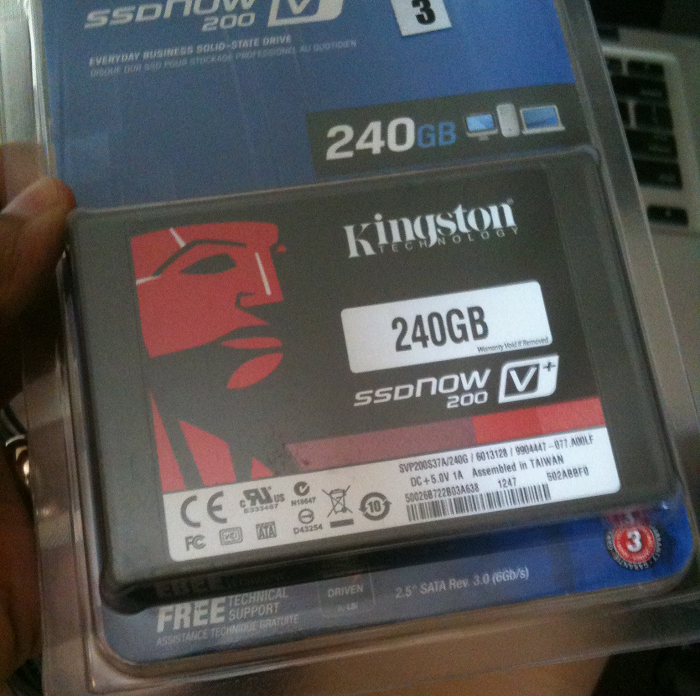 I had initially zeroed in on the Samsung EVO 250 Gigs drive, but ultimately settled for the Kingston which I’ve (a good) experience with. 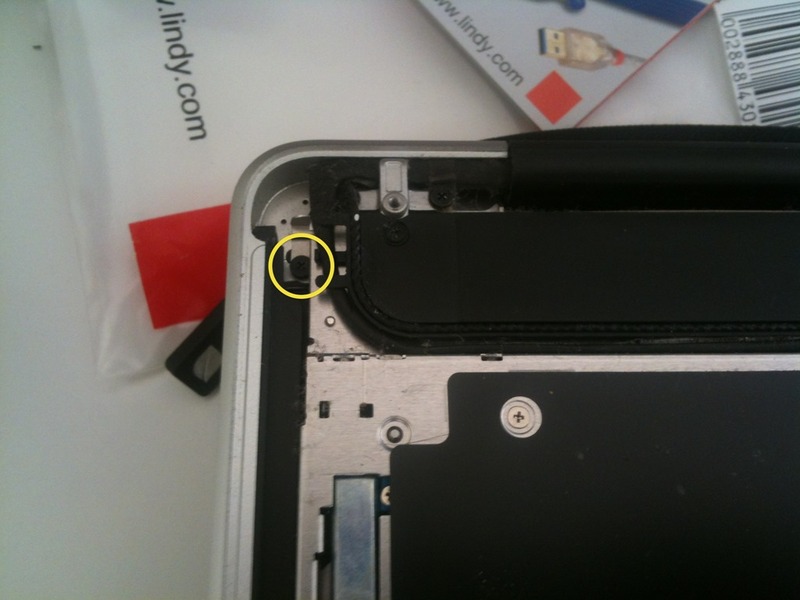 Step 1: Flip your MacBook Pro and unscrew the 10 or so screws. 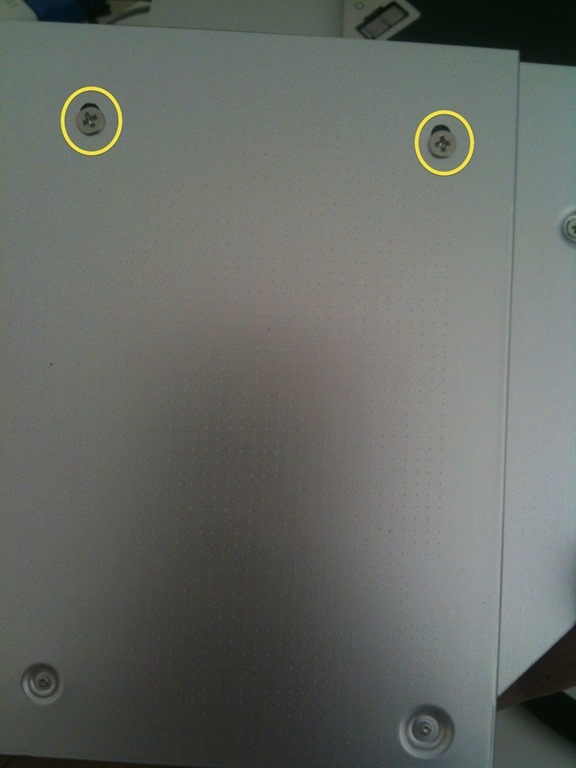 Start from the top right corner and go anti-clockwise, the first three screws will be the longer than the rest. Step 2: Before we remove the Optical drive we have to unhook two flat cables. First one connects the optical drive to the MoBo and the second one connects the HDD to the MoBo. Use a plastic spludger or your nails to gently lift them up as shown below. Step 3: There are three screws that hold it in place, and there is a connector cable to the motherboard that we have to remove. 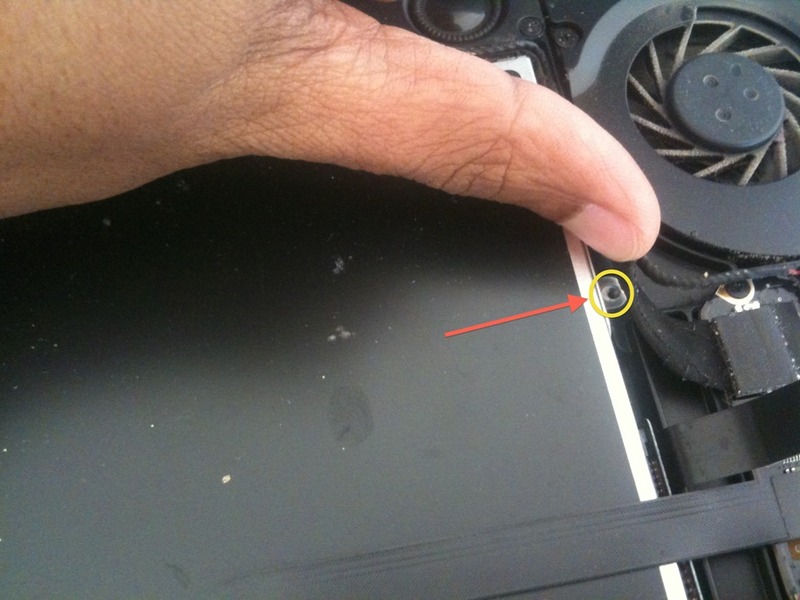 The first screw is under the cable towards the center of the system. You have to push the cable up, to reveal the screw. Step 6: Next lift up the Optical drive from the bottom left corner gently. It will come up only about a centimeter then pull it towards yourself. 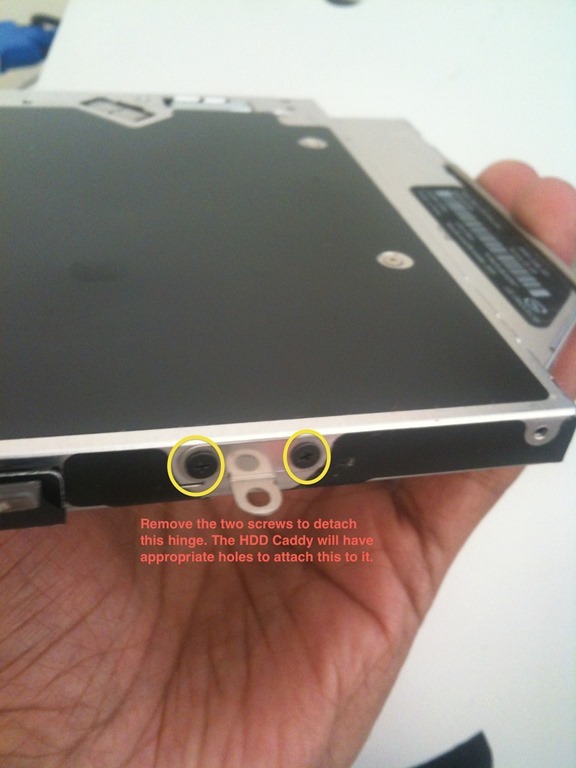 If you encounter resistance bend the battery sticker and the straighten the HDD flat cable, they are stiffer than they look. Step 7: Once you have extracted the Optical Drive there is a hook attachment that you need to unscrew and screw it back to the HDD caddy. 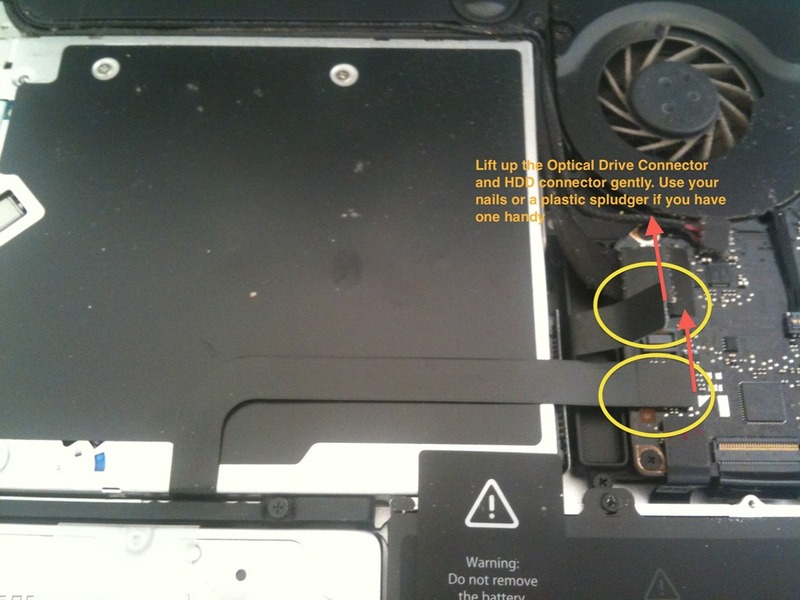 Step 8: The flat cable that we removed from the Motherboard earlier goes into the Optical drive via another adapter. 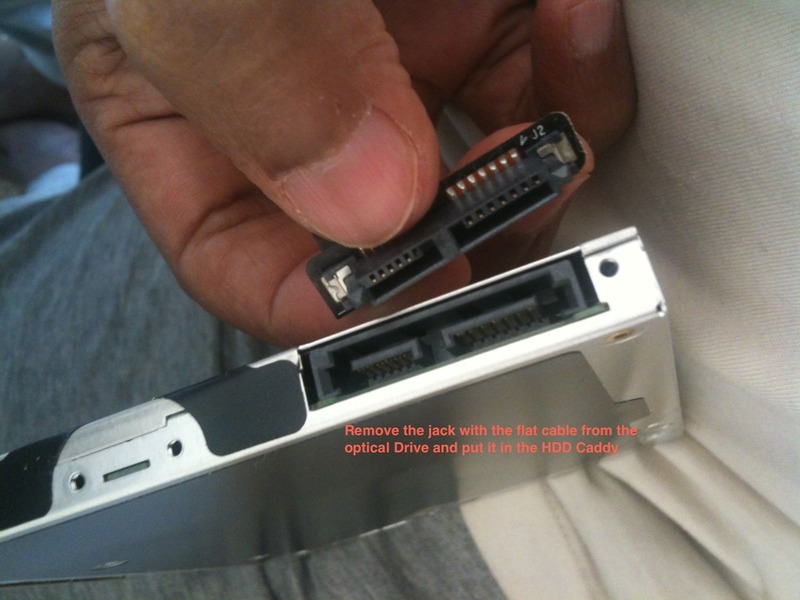 Gently pull it out as well, after you have put in your new HDD into the HDD caddy, you can put this adapter back into the HDD Caddy. 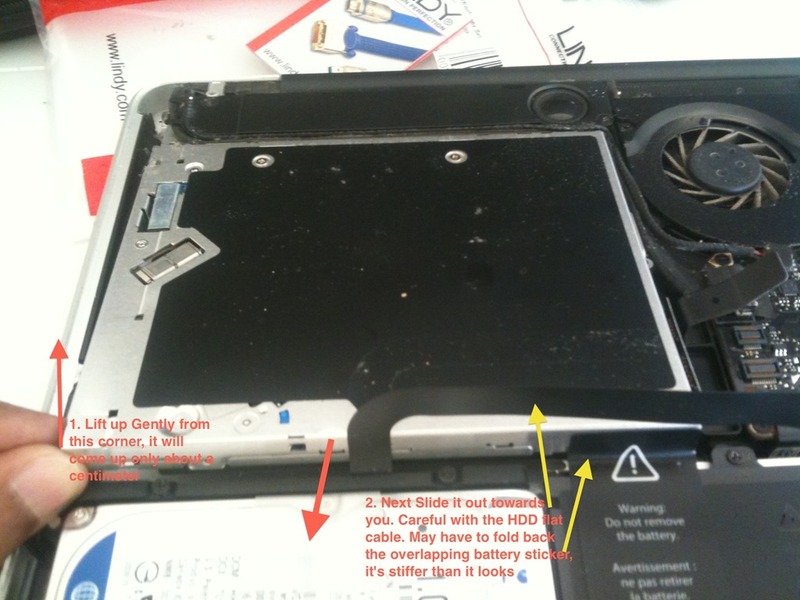 Step 10: Here on it’s the inverse process of Step 6 and go back carefully, till your MacBook is bolted up. You are probably wondering why I put the new SSD into the HDD caddy instead of the Hard Drive bay because OSX can’t boot off a drive in the Optical Drive bay. Well, I use Windows 8.1 via VMWare Fusion more often than I use the native OSX, and running the VMs off the same drive as the OS was really stretching it. OSX would literally be rendered useless when the VMs was running. I moved the VM to an external USB drive, that improved things but had it’s own set of issues with the VMs crashing after going into Sleep mode and so on. I want the SSD to be where my VMs are run off. After the installation, OSX is slightly more useful with the Win8.1 VM running and the Win8.1 VM simply screams. 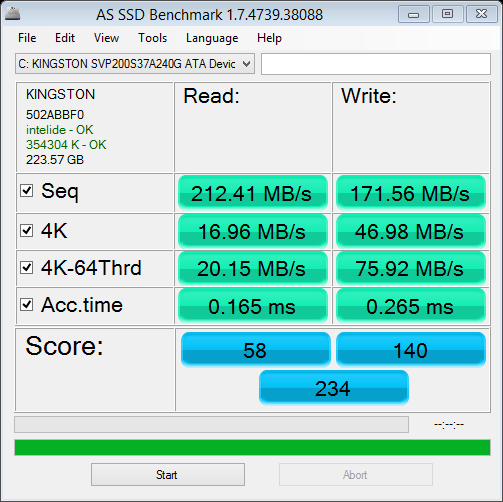 It is almost as fast as Windows on SSD natively. I moved the VMWareFusion.app to the SSD as well. Sometimes we just hate OSX for being a ‘*****’. The case here being TRIM support for Apple installed SSDs only. YES! OSX Lion supports TRIM but only for Apple installed SSDs not third party SSDs. After you have ‘Initialized’ your drive using Disk Utility tool, get yourself Chameleon SSD Optimizer or some other similar third party product and enable TRIM on your SSD without fail. YMMV so use it at your own risk. The Disk Utility Tool will pop up and ask you to Initialize the disk first time you boot up and it detects the SSD. Things are going well so far. Near native Windows performance and OSX can be used in parallel. Most people do the opposite by putting the OS on the SSD and moving everything else off it. In my case I don’t need OSX to run any faster than it is at the moment. I needed a stable and better performing Windows VM. I got that. This is a strictly temporary situation until I get my Haswell computer together and the SSD might be repurposed there, but that story is for later. P.S. Amazon decided that I could wait for the Optical Drive enclosure so it has scheduled it for delivery in December . Till then the Optical Drive is wrapped away in bubble wrap. Once the drive enclosure arrives I’ll be able to use the Optical Drive as an external USB drive. I’ve been holding off on an SSD upgrade for a very long time now, simply because I didn’t want to be limited to 40-60Gigs of drive space even though it’s more than enough for an OS partition. But cost of SSDs have fallen pretty fast over the last 6-8 months and I saw a Kingston 240GB available for little under INR 12K at Flipkart last Monday. So I went for it finally. 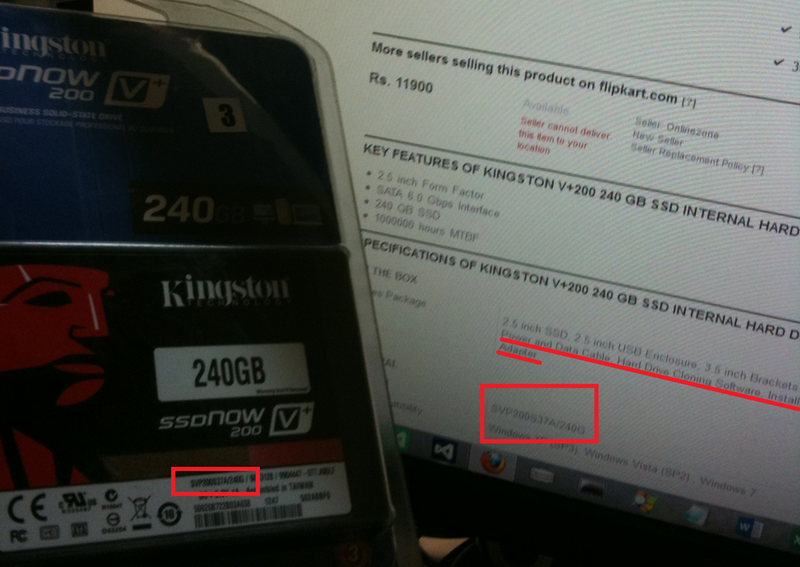 I got the Kingston V+200 240 GB SSD Internal Hard Drive (SVP200S37A/240G) from Flipkart for Rs.11,542/-. Snagged an extra 10% discount during one of their Monday Sale events. The physical installation was a little tricky because the above model unfortunately didn’t come with a bay converter. 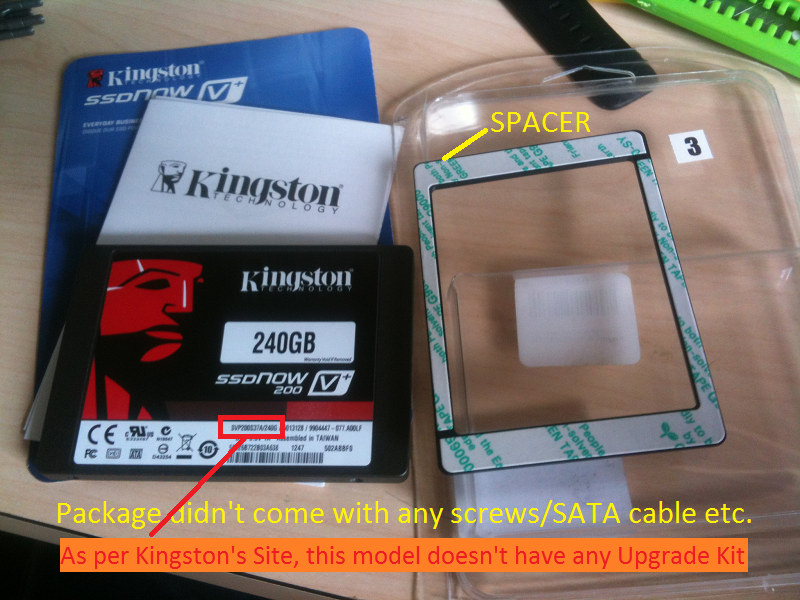 Neither did it come with SATA cable or screws (as falsely promised by Flipkart). Anyways, for someone who’s been assembling computers for the last 15 years I had enough backup screws . 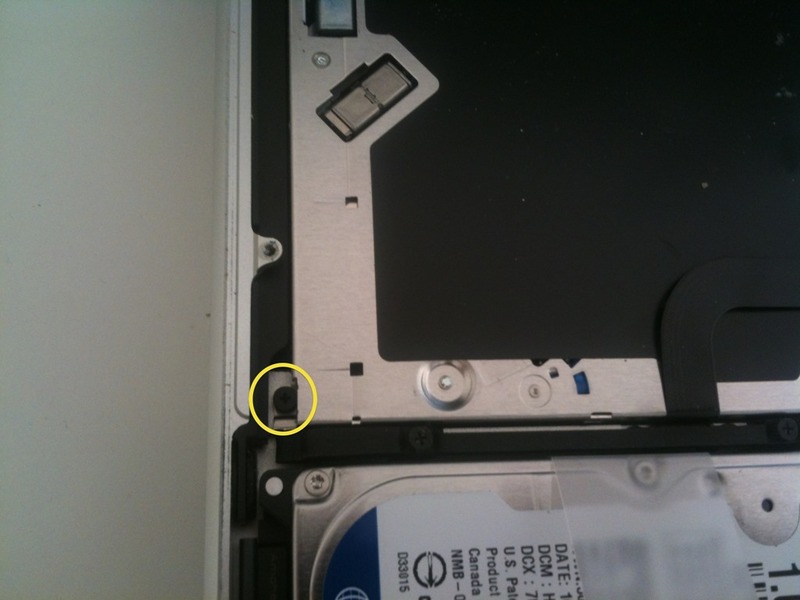 The SSD came with a self adhesive plastic rim that’s supposed to act as a spacer if you are using it in a laptop. I used the spacer as a stand as I rested the SSD belly up on one of the bays and put in two screws to hold it in place. (Use screws that come for CD Drives, the other cabinet screws are bigger, the drive is delicate so don’t force bigger screws in, you might just void the warranty). Once connected, I booted up to the Windows 8 Partition I had and installed the EaseUS Todo Backup 6.0 Free. Actually I won’t repeat the steps, you can just follow LifeHacker’s excellent guide. That’s what I followed. I did not have an issue with ‘emptying’ my HDD because my existing drive was 250 Gigs too. I could have literally copied partitions and run with it. But I took the opportunity to remove some junk from My Documents and My Downloads which I was anyways going to put on my HDD once I restored my system. Turns out I was using only about 80Gigs of space in total . Note: If you follow the guide, once done with the partition swap and booted into Windows 8 with your SSD, it is suggested that you format your old hard drive. At this point you will be able to see a 300 odd MB ex-system partition ON THE HDD. Feel free to remove it and reclaim the entire space. Since EaseUS Backup is actually a Backup tool it installs a couple of services. I didn’t want to use EaseUS Backup once I was done with my restore, so I disabled the services and apparently EaseUS doesn’t like that so it doesn’t run without it. Not a big deal, just thought you might want to know. Warning: Here on things get all geeky so don’t blame me if it’s long and winding. Who doesn’t want to know how their ‘investment’ improved things . The first Wow was the near instant boot up. My desktop now boots nearly as fast as my Surface RT. Actually my BIOS startup takes longer than going from the boot logo to login page. Visual Studio snaps open, Word/Excel/PowerPoint fly open in no time. Fair enough but how did the SSD actually stack against the competition? 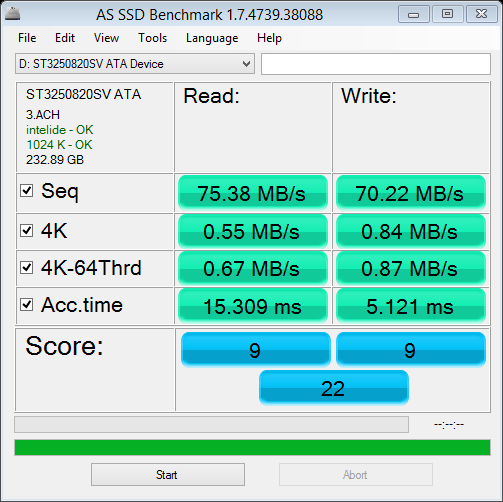 A quick search revealed the excellent AS SSD Benchmark utility (Direct Download, you can visit Alex’s Site for more information, though major parts are not in English). Billions for blue blistering barnacles, that’s crazy compared to the HDD. But after a little searching it was apparent this was nowhere close to the peak performance the SSD was capable of. According to this thread, it wasn’t really optimal performance. I was worried that the ‘Sandforce Controller’ was not working correctly. After hours of searching (and multiple BIOS updates later) the conclusion was much more reassuring. Most sites will tell you to enable AHCI in your BIOS and if you go to buy a Motherboard today it will probably come with AHCI default. But unfortunately my M/B is an ageing 6 years+ for a first Gen Core 2. It never had AHCI support to start with. Unfortunately I didn’t find things out in the order I am presenting here, so I spent about half a day researching how to upgrade my BIOS and applied all the upgrades available to it, which did lead to a more stable S3 sleep mode, but no AHCI. But I just couldn’t stop until I read on this site that AHCI is not supported on ICH7 chipsets! It pointed to some Intel documents that seem to be currently unavailable, but anyway, that’s when I stopped. So if you have the Chipset ICH7 stop looking of AHCI support in your BIOS. There are other variants of ICH7 like ICH7-DH, ICH7R and ICH7M that have AHCI support, plain vanilla ICH7 does not, end of story. If it says ‘intelide’ you have an IDE controller. 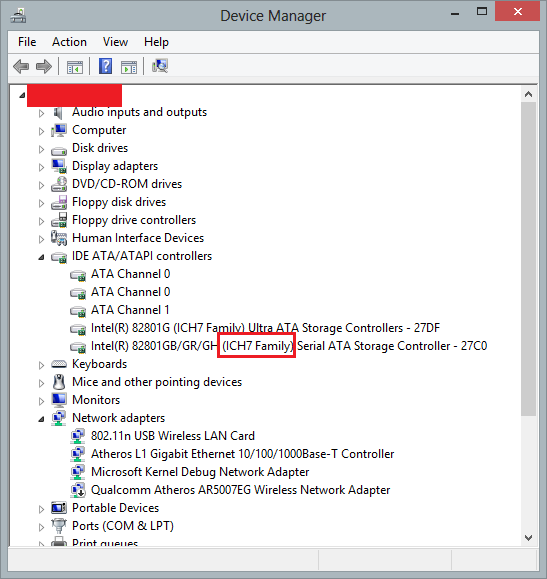 AHCI controllers usually say iastor or msahci, first one being an Intel Driver and the next one being a native Microsoft Driver. Well, that wraps the story of my SSD upgrade. If you have an ICH7 I hope it saved you some time from looking up a BIOS Setting. 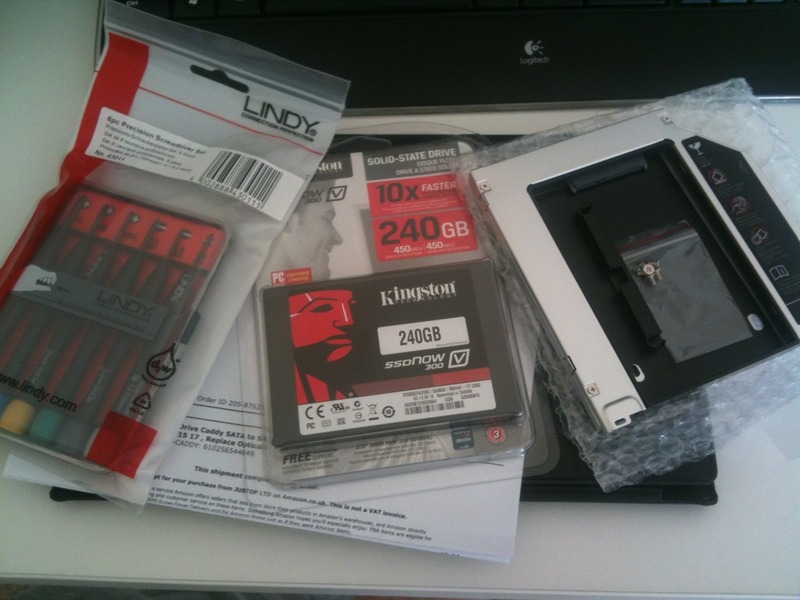 Someday soon, I’ll be upgrading to a new M/B + Processor and this SSD should be right at home. I’ll post an upgraded result then. PS: This post has been a month in the ‘writing’. As you can see from the timestamps in the above image, I did the upgrade just about a month ago. 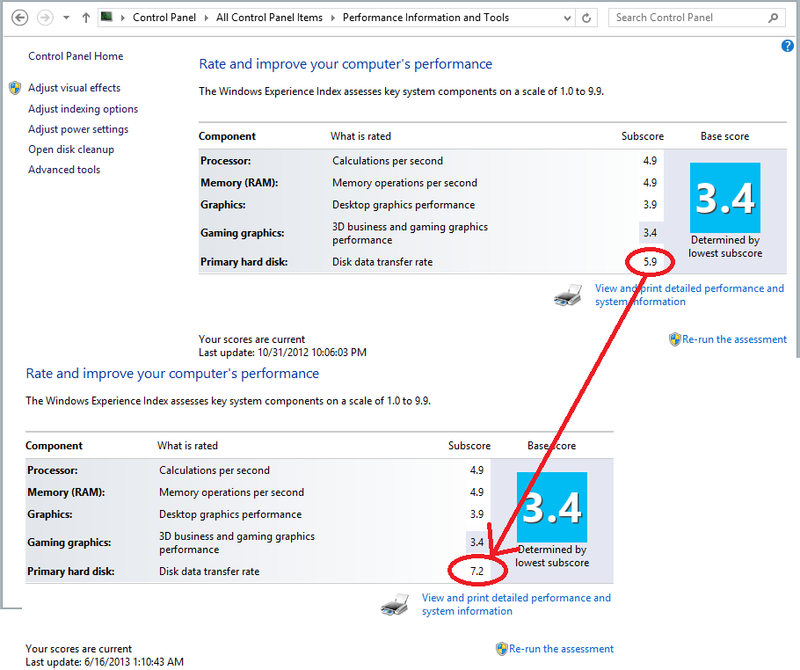 So far so good, all’s well with the Kingston drive on Windows 8 Pro, perfectly stable and much smoother performance. Footnote – I was a happy FlipKart customer till this purchase. First they got the model number and the package contents mixed up resulting in falsely advertising things they didn’t have in the package. Next, on complaining, they responded 5 days later expressing willingness to exchange it. I had installed after waiting for 72 hours without response to my complaint. They closed it well by giving me a discount voucher of Rs. 500/-. Things would have ended there but a few weeks later they took down my review of the product from their site and sent me a mail demanding I change my review (it was rated 3 star initially and I upgraded it to 4 star with details of all that was happening). That’s the straw that broke the camel’s back. I refused to change the review because it had all the ‘facts’ as it had happened. I loved Flipkart but their stupid behavior has left me with the feeling they don’t want their customers to benefit from true reviews and they just want “oo nice service Flipkart’” type reviews instead. Well, I might as well shop from ebay in that case. Also when I last checked the SSD was still advertised with the incorrect Model Number vs. Features. Never shopping at Flipkart again!